Descendants: Wicked World will be back. This week, Disney Channel announced they’ve renewed the animated series for a second season. The short-form series follows the offspring of classic Disney villains like Mal, the daughter of Maleficent, and Carlos de Vil, the son of Cruella de Vil. Season two of Descendants: Wicked World is set to premiere this fall. Growing consumer interest in “Descendants” stories brings a second season of “Descendants: Wicked World,” the animated short-form series that has reached over 30 million Total Viewers in the U.S. and has also delivered over 100 million consumer engagements on the Disney Channel app, VOD and YouTube. Featuring three original songs and introducing new characters, “Descendants: Wicked World” season two is slated to begin airing this fall across multiple platforms including Disney Channel, the Disney Channel app, video-on-demand and on YouTube. 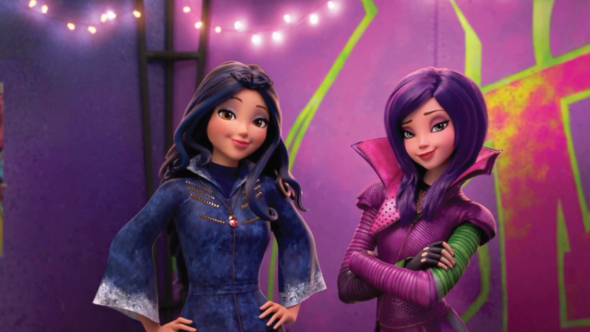 The first season of “Descendants: Wicked World,” which followed fan-favorite “Descendants” characters Mal, Evie, Carlos, Jay as they tried to fit in at Auradon Prep, will culminate this FRIDAY, JULY 15 (8:00-8:30 p.m. EDT) with “Neon Lights Ball,” a half-hour special that will feature six back-to-back episodes and introduce CJ, the daughter of Captain Hook. During “Neon Lights Ball,” fans will be given a taste of the mystery and excitement that will fuel the highly anticipated sequel movie “Descendants 2,” which will begin production in the coming months. Additionally, viewers can test their “Descendants” knowledge with Disney Channel Live Play, an interactive viewing experience featuring real-time trivia and polls via the Disney Channel app on iOS devices during the east and west coast telecasts. Joining the cast for “Descendants: Wicked World” season two in recurring roles are Bradley Steven Perry (Disney XD’s “Lab Rats: Elite Force”) who will voice “Zevon,” son of Yzma from “The Emperor’s New Groove” and Lauryn McClain (“Daddy’s Little Girls”) who will provide the voice for “Freddie,” daughter of Dr. Facilier from “The Princess and the Frog.” The stars of “Descendants” will continue to provide the voices for their respective animated characters in the second season including Dove Cameron as Mal, Sofia Carson as Evie, Cameron Boyce as Carlos, Booboo Stewart as Jay, Mitchell Hope as Ben, Brenna D’Amico as Jane, Sarah Jeffery as Audrey and Dianne Doan as Lonnie. Additional recurring characters in “Descendants: Wicked World” are Ally, daughter of Alice in Wonderland (voiced by Jennifer Veal); Jordan, daughter of Genie from “Aladdin” (voiced by Ursula Taherian) and CJ, daughter of Captain Hook (voiced by Myrna Velasco). What do you think? Have you seen Descendants: Wicked World? Are you glad it’s been renewed? More about: Descendants: Wicked World, Descendants: Wicked World: canceled or renewed?, Disney Channel TV shows: canceled or renewed? Girl Meets World: Is the Disney Channel TV Show Cancelled or Renewed for Season Four?